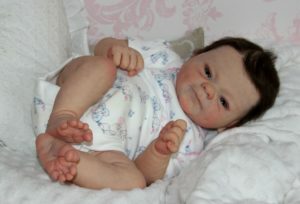 This beautiful reborn baby Bonnie Brown Twin A is currently for sale on ebay. I love this sculpt, it is one of my favourites. I am not the very talented reborn artist for this baby. SHE IS NOT A FULL BODIED SILICONE DOLL ! A very warm Welcome to my Auction ! My Name is Yvonne and I am the sole Artist behind Perfect Bliss Nursery. I would like to introduce Baby Twin A to you! Using only the best quality materials, I have put a lot of time, love, care and attention into my work. 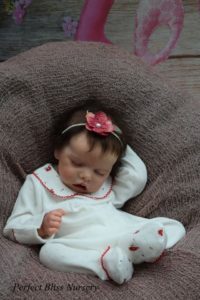 Twin A can wear Tiny Newborn baby clothing 5- 6lb. 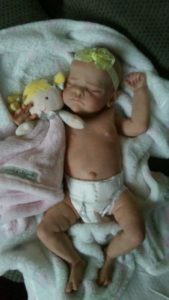 I’m sure Twin A will be going to a loving and caring home and you will not be disappointed with this little adorable girl. Several thin layers of Genesis Heat Set Paints have been individually heat set at 130 Celsius before applying the next Layer to build up a real looking Baby skin with mottled Undertones and slight Veining (also slightly blue undertones where the skin appears to be naturally thinner). All Creases have been highlighted and shaded, her Finger and Toe nails got detailed and sealed. The Eyes, Nostrils and Mouth have a moist look. I have rooted Twin A’s head with the finest premium quality mohair Dark Brown, I then sealed it from the inside so you are able to gentle wet and style Twin A’s hair to your likes. She also has wispy rooted Eye Lashes. 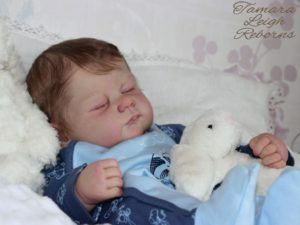 Twin A has a beige body with jointed arms and front loading legs, which I filled with a combination of Glass Beads and Fibre Fill to give Twin a soft cuddly realistic Feel. The limbs have been weighted with micro fine Glass Beads and topped with Fibre Fill and then have been sealed. 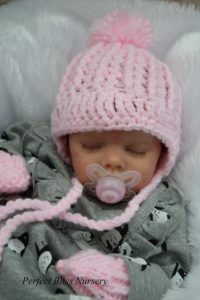 Her head is weighted with Glass Beads and surrounded with Fibre Fill , you will need to support her little head when picking her up just like you would do with a real Baby. Twin A does not have any magnets, the Dummy has been modified to fit in her Mouth.